Today is a holiday for Canadians. Thing is, I’ve been extra busy with my band and attending a host of geek events that are held in Toronto. My wife has been very patient with me and so I told her that I would happily go to the beach with her and the family for the last day of the long weekend. For you, that sounds like something grand. Not me. I’m not a huge fan of things like sun, sunscreen, water, sunburns, sand, sand stuck to sunscreen, sand in food, lake water mankyness, etc. Now, I don’t want to sound like a party pooper, but… I’m a party pooper. However, I am quite happy for others to have a wonderful time at the beach as long as my presence isn’t required. However, my children seem to want me to come to these family outings and so we decided today was a day for the beach. Huz… zah. Notice what’s missing? Electronics. The sun is too bright for screens. I can knit! The great thing about being outdoors now is that I can knit! So I packed my knitting. And I’m still using my glow in the dark yarn! And the answer is still no. I’m still knitting Totoros. But there is a reason for that! 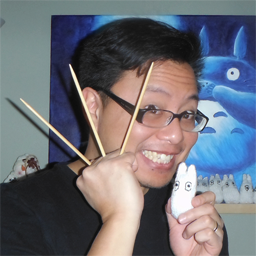 Debs & Errol are doing an Indiegogo campaign and one of the perks is a knit Totoro shaker! That means I have to knit over ten of them. Good grief, why do I agree to these things? Clicking on the link will bring you to our campaign! The beach was packed, of course. Keren was offering to drop us off and we could walk to the beach, but honestly, she’s the one that wants to be there. Of course, she still has to argue with me that she will find a parking space while we go find a spot on the beach. And so we go back and forth on who has to be the one that will park the car. It’s obvious she doesn’t want to park the car. It’s blatantly, pimple-on-forehead obvious that I will postpone my beach exposure as long as humanly possible so let me park the car! But for some reason, she still argues with me. Finally, I drop them off and start the hunt for a parking spot that’s at least within hiking distance of the beach. Fortunately, the parking spot I eventually find is only a ten minute walk! At least, it’s ten minutes when I walk to the beach. I may or may not have been rushing. When I get there, the children have begun digging holes and my wife is resting on the sand. We have a couch and a bed at home. Why lie down out here? My eldest daughter had a nice blanket set up for her which eventually became my blanket so I sat down and took out my knitting. I also kept twitter abreast of my activities, not because the twitter world was interested in anything I had to say, but I had to do something that involved electronic interaction in some way! I realize afterwards I am too close to her muddy splash radius. For the most part, this composed my day. I would knit, my children would dig holes and my wife would play woman by the well as she needed to provide a steady supply of water for their hole. They soon found some clay by the river (there was a river which went into the lake) and then things got even muddier. It was really cool though, because the river and the water were all misty. There is a good scientific reason for this which we learned in grade seven, or even earlier, but that was a long time ago… so I’m going to say it was magic. People were fishing in this river. They were fishing all over. Canoe people were trying to find a space to get in around the fishers. It was a funny feud to watch. As the day went on, it became hotter and I moved to a rock in the shade. The shade was surprisingly cool. I had a very peaceful time sitting by the rock, tweeting, and knitting my Totoro. Fortunately, no one stopped to ask me what on earth I was doing. I may, however, have been the only knitter at the beach. Yarn on one leg, phone on the other, and a comfy rock. I HAZ A ROCK! “Wait until I’ve finished this row!” I shouted in reply. I bet that isn’t heard often on the beach. Anyway, here is one reason I kinda dread going to the beach. See, I like doing the sand sculpture thing, where you make your daughter into a mermaid, but it takes time. And I have two daughters. And a few nieces too. So the novelty wore off one day when I was at the beach with four girls all screaming to be made into mermaids and it was deathly hot out and I was just their asian, slave digger. But that’s the grinch in me complaining. In all honesty, it is kinda fun. And Zoe likes it when people stop and “Oooh!” at her because she’s a diva. Eventually, my cousin and her friend showed up and they entertained the children. I got to do a bit more knitting and we even got some food. I won a free pizza a month ago from the movies during Timeplay but we had way more food than we could eat. So in the end, Keren gave the food to some young twenty-somethings playing volleyball who probably decided that they would do a potluck at the beach but in their lack of foresight they didn’t realize everyone would just bring chips and pop. They were pleased to have the pizza. And myself? I didn’t finish the Totoro Shaker, but I did have a nice day knitting at the beach. Six hours later, it was getting chilly so we decided to go home. I donned the blanket and prepared myself for the long trek back to the car. My wife tried to argue that she would go get the car, but honestly, it was only out of habit now and I set forth to end the beach day. All of this was chronicled in my twitter feed. There were more pictures. I spared you. Posted on May 20, 2013, in knitting, project and tagged beach, family, shaker, totoro. Bookmark the permalink. 3 Comments.